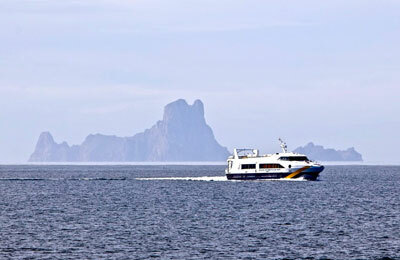 You can use AFerry to book a Mediterranea Pitiusa ferry between the two main Pityusic islands - Ibiza and Formentera. Mediterranea Pitiusa was founded in 2000 and has a fleet of four vessels. AFerry always has cheap prices for Mediterranea Pitiusa and the latest special offers. See below for the latest Mediterranea Pitiusa Ferries prices and sailing times. Click on your ferry route for a detailed timetable. Mediterranea Pitiusa operates a fleet of 4 vessels, running two different services. Jet line services make the 70km crossing in just 25 minutes, while Express services take a little longer at 35 minutes. 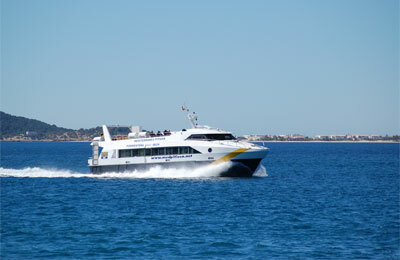 Services are high speed and as such onboard facilities are limited. However, stunning views can be had from the open deck, and from the lower deck via panoramic windows. Both decks have comfortable airline style seating. Whether you book Mediterranea Pitiusa Ferries from Formentera to Ibiza, or Ibiza to Formentera, you will know that you got a great deal from AFerry. 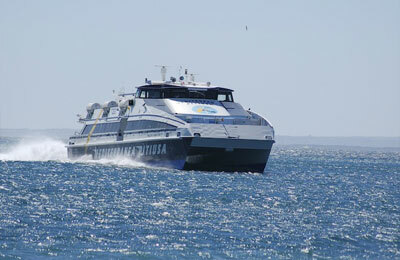 How long before departure should I arrive for Mediterranea Pitiusa Ferries?